The sound of brass band is quintessentially British, from the working class traditions of works and colliery bands to the bandstand concert in the park and the seaside where, as we all know, they play "Tiddely-om-pom-pom!" Think too of the military bands playing at parades, Remembrance Day or Trooping the Colour. One of the victims of this month's Radio 2 schedule reshuffle is Listen to the Band (presenter Frank Renton pictured above).. 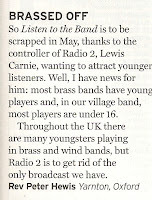 Even though there is still a strong brass band tradition in the UK with good grass roots support from young players the decision has an air of inevitability about it with the programme offering little in the way of new material and having been pushed further and further to the margins of the schedule. Listen to the Band has been running weekly on BBC Radio 2 since 1976 but the title is of a much older vintage tracing back to 1941. That show along with Bandstand (in its various incarnations), Music While You Work and Marching and Waltzing have showcased brass and military bands for decades. The first broadcast of a military band concert, the Band of HM Irish Guards, was as far back as 23 January 1923. Some of the regional stations had their own military bands, the one at station 2ZY in Manchester was conducted by Harry Mortimer, more of whom later. 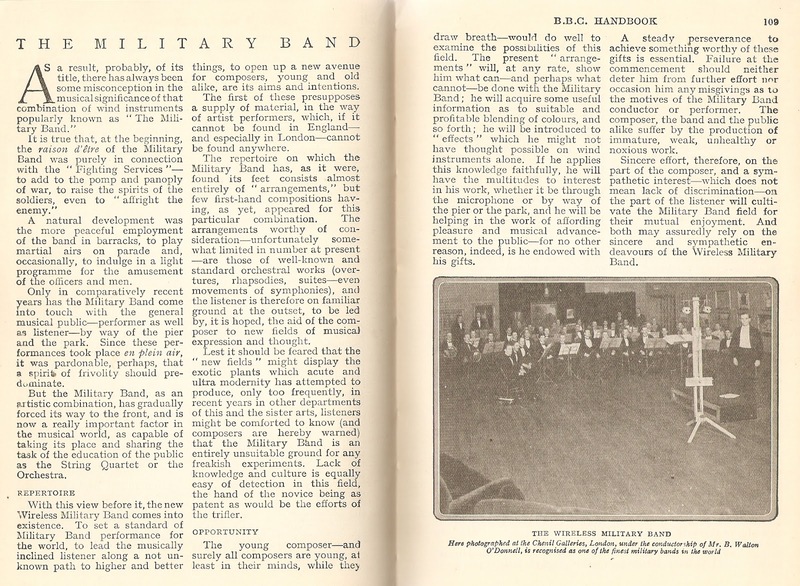 In 1924 2LO's musical director Dan Godfrey formed the 2LO Military Band, later known as the Wireless Military Band and then the BBC Military Band. The band's regular conductor was Bertram Walton O'Donnell, nicknamed 'Bandy' and then, following his untimely death from pneumonia in 1938, by his brother Percy O'Donnell. It became the main broadcasting military band, heard most weeks and playing both established pieces and music specially commissioned for it. It was disbanded, as a cost-saving measure, in 1943. Alongside the in-house bands were the usual suspects such as Grenadier Guards, Royal Marines, the central Band of the RAF, various police bands and, post-war, the National Military Band. On pre-war radio broadcasts the stations would often cover the brass band competitions, including the national one from Crystal Palace (later at Alexandra Palace) and the Belle Vue contests in Manchester. Some of the famous colliery and works brass bands were also heard and continued to be featured in dozens of post-war programmes and these still perform to this day (albeit with slightly changed names): Foden's Motor Works, Black Dyke Mills, the Brighouse and Rastrick, Fairey Aviation Works and Grimethorpe Colliery. When Music While You Work started in 1940 it regularly included military and brass bands, through it tended to favour the former. In later years one of the Wednesday editions was given over to one of the military or brass bands. 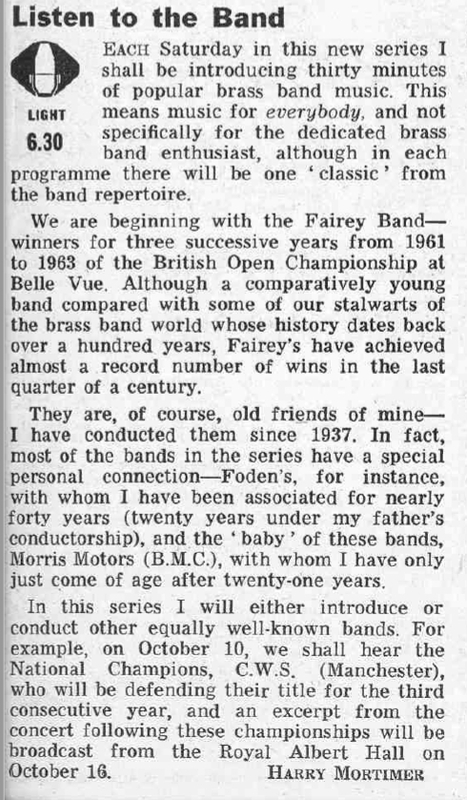 Such was the importance given to this music genre that in July 1936 the BBC appointed Denis Wright to the post of Supervisor of Brass and Military Bands within the music department. A former teacher and then music editor at Chappell & Co he introduced some innovations in the broadcasting of this type of music. Realising that much of the music was written to be performed outdoors he re-arranged pieces for studio performances. He also changed the band formation to provide a better sound balance. Wright moved on to the Corporation's Overseas Services music division in 1942 and post-war continued to write and arrange for brass bands. One of the biggest names in banding is, of course, Harry Mortimer. From a very musical family - his father Fred conducted the Luton Band and then the Foden's Motor Works Band and made dozens of broadcasts until his death in 1953 - he played cornet and trumpet for Fodens and a number of orchestras including the BBC Northern Orchestra (now the BBC Philharmonic). He was also encouraged to conduct and to compose and by 1942 was asked to take over the post of Supervisor of Brass and Military Bands following the departure of Denis Wright. Under Mortimer's purview he introduced a number of programmes featuring brass and military bands the most significant of which was Listen to the Band. (The title Oh, Listen to the Band had previously been used during the war for a programmes with bands played out on record). Starting in February 1943 it featured a different band on each show and ran weekly on the Home Service, at first on Sunday mornings but then settling into a Saturday afternoon slot through to March 1963. Listen to the Band returned in September 1964 for a 3-month series, this time over on the Light Programme. By now Harry Mortimer had retired from his BBC post but was still heavily involved in brass band music and he presented the new series. It was back again in October 1965 but this time using one of the other preferred BBC titles for brass and military band music, Bandstand (later billed as Saturday Bandstand), with Harry and then Paul Martin "inviting you to Listen to the Band." 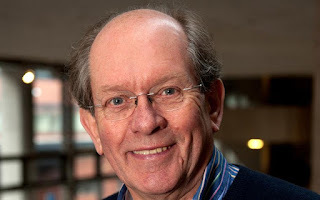 With Mortimer leaving the BBC responsibility for overseeing this music fell initially to each of the regions and then in 1965 to Geoffrey Brand and later William Relton until he moved on to manage the BBC Symphony Orchestra in 1970. When the Light became Radio 2 in late September 1967 the original title was back in use but now announcer John Dunn was presenting followed by Jimmy Kingsbury between 1970 and 1972 when the programme was dropped. In the summer of 1972 brass and military bands were now only included in the show Brass and Strings and Other Things (later just billed as Brass and Strings) performing alongside the likes of the BBC Radio Orchestra or the BBC Midland Radio Orchestra, all linked by one of the staff announcers. In October 1976 Listen to the Band returned to Radio 2 and has remained on air ever since. By now Charlie Chester was presenting, though I'm not aware that he had any particular interest in the music and, in a nod to its history, the first band was the Morris Concert Band conducted by good old Harry Mortimer. Here's a clip of Charlie with Listen to the Band from 26 January 1982 featuring the Western Band of the RAF. There's a complete edition of the programme with Charlie Chester presenting over on the Masters of Melody website. Dating from 27 July 1977 it features the Band of the Women's Royal Army Corps. This edition dates from 11 May 1977 and features the Hammonds Sauce Works Band. In 1987 composer and brass band conductor Roy Newsome took over presenting duties followed in 1995 by Frank Renton who had considerable experience of both brass and military bands. In this edition of Listen to the Band from 4 February 2016 Frank talks to trombonist and arranger Bill Geldard. In the 1970s brass band music received something of a fillip when it featured in the UK singles charts. In the 1972 hit You're a Lady Peter Skellern was accompanied by the Hanwell Band and six years later the Grimethorpe Colliery Band appeared on his single Love is the Sweetest Thing. Meanwhile in 1977 the Brighouse and Rastrick Brass Band reached number two with The Floral Dance with Terry Wogan championing the record on his breakfast show. Later that year Terry recorded his own version, this time with the Hanwell Band, and made a couple of unlikely appearance on Top of the Pops in January 1978. The history of brass and military band broadcasting can't ignore another couple of programmes: Bandstand and Marching and Waltzing. Brass Bandstand was a series that ran for a few weeks each year on the Home Service between 1945 and 1954, with regional variations such as Scottish Bandstand, Midland Bandstand and so on. Meanwhile on the Light Programme we had the daily show Bandstand from 1945 to 1950 and then appearing weekly from 1953 to 1964. The title was resurrected again in March 1965 when the daytime Music Programme of the Third Programme extended its hours and included a weekly show alternating brass and military bands. 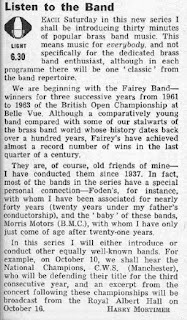 Not surprisingly Harry Mortimer was back again on the first edition conducting the combined BMC (Morris Motors), Fairey and Fodens band. 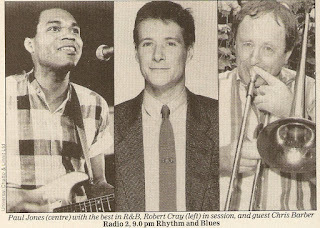 Bandstand continued on Radio 3 until as late as 1988. There are excerpts from the programme on YouTube. BBC radio ran a number of brass band knockout competitions between 1961 and 1974. The Northern Brass contest heard only in the North, Midlands and Northern Ireland regions became the national Challenging Brass in 1964 flipping between the Home Service, the Music Programme, Radio 4, Radio 2 and then Radio 3. The sound of various Salvation Army bands were heard on Sunday mornings between 1975 and 1979 when Ray Moore presented Banners and Bonnets. Marching and Waltzing provided, as the title suggests, a mix of waltzes played by a light orchestra and marches played by a military or brass band. It started on the Home Service in 1940 and for the first decade was a record programme. By 1950 it started to regularly feature the Raeburn Orchestra on the waltz side under the direction of Wynford Reynolds who had, during the war, being the organiser of Music While You Work. By the early 60s Marching and Waltzing was back to being a record only show but got a new lease of life on the Light Programme with a couple of series in October 1965 and October 1966 in a joint production with the World Service - with World Service announcer Peter Reynolds providing the introductions. Geoffrey Brand, the brass band conductor and BBC producer who had taken over Harry Mortimer's old role as Supervisor of Brass and Military Bands, writing in the Radio Times was quite effusive about the programme and the pictures it conjured up: "Parade grounds filled with soldiers in red tunics moving in perfect formation; armies marching into battle to the sound of the band; or perhaps a Carnival procession with its gaiety and excitement, all being headed by a band playing a march. In contrast the waltz - and the soft lights and smooth sounds of the orchestra in the ballroom. Lovely evening gowns colourfully float across the floor as dancing couples glide rhythmically to the lilt and charm of the music." Marching and Waltzing made a return in September 1967 on the newly launched Radio 2 with Jimmy Kingsbury announcing the various brass and military bands plus the BBC Midland Light Orchestra under Gilbert Vinter - himself a composer who'd written a number of pieces for brass bands during the sixties. Later the BBC Northern Ireland Orchestra was the main outfit providing the waltzes. It was again dropped in 1970 but made one last gasp between 1980 and 1984 with various staff announcers looking after the programme and one of the main orchestras being the London Studio Players led by Reginald Leopold and conducted by Iain Sutherland. In this edition of Listen to the Band from 25 April 2017 Frank Renton recalls the Marching and Waltzing era. And here is an edition of Marching and Waltzing kindly provided to me by Paul Langford. Paddy O'Byrne introduces the Band of the Coldstream Guards conducted by Lt Col Richard Ridings and the Orchestra led by Reginald Leopold and conducted by Marcus Dodds. It was broadcast on 4 August 1981. Local radio didn't ignore brass band music and a number of BBC stations used to have programmes devoted to it. Up in Yorkshire I know that Radio Leeds had Brass Tacks with Mike Meadmore and Great Northern Brass with Barrie Davenport whilst Radio Sheffield had a regular competition called Bold as Brass. BBC Radio Durham had Brasstime and Radio Birmingham ran a competition titled Birmingham Brass. Commercial radio was less interested though in the 1970s Radio Clyde had The Sound of Brass with Bob Mason, Radio Forth used the same title for programmes presented by Bill Torrance, at Radio Hallam Roger Moffat looked after Best of the Brass and even Viking Radio when it started in 1984 had Viking Bandstand. Although Listen to the Band has long since dropped brass and military band sessions, relying instead, for the most part, on commercial recordings, the axing of the programme has rightly been seen as a blow to the banding world. Although Radio 2 has promised to support the annual Young Brass Awards as part of Friday Night is Music Night this leaves the only radio programmes dedicated to playing this kind of music as David Hoyle's Yorkshire Brass on Radio Leeds and Paul Hunt with The Sound of Brass on BBC local radio in the south west. Listeners on the Isle of Man can hear Manx Radio's Time for Brass with Ian Cottier and both Angel Radio and Serenade Radio occasionally play music of this genre. As for Frank Renton he'll continue to feature brass band music in a fortnightly online show from brasspass.tv called Frank Renton: Still Listening to the Band. The final edition of Listen to the Band airs on Tuesday 8 May. Phillip Hunt will be marking the end of the programme on the 13 May 2018 edition of Sounds of Brass. With the axe falling on The Organist Entertains this month radio loses a programme that's just a year shy of celebrating its golden anniversary and, at a stroke, breaks a tradition of broadcasting organ music that goes back to the earliest days of the BBC. When radio broadcasts started in the early 1920s organ music was regularly head on 2LO with recitals from Steinway Hall in Marylebone Lane. Many early broadcasts were church or symphonic organ recitals but increasingly there were transmissions from theatres and cinemas offering listeners the opportunity to hear the full orchestral range of the new theatre organs up and down the country. 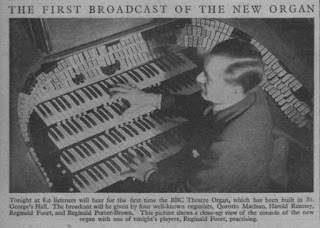 The BBC's first organ was installed in the Concert Hall (now Radio Theatre) in the newly-constructed Broadcasting House. Built by the renowned organ-maker John Compton the concert organ was "the first organ in this country to be designed especially with a view for microphone transmission." Its inaugural broadcast was on 16 June 1933 in a concert of classical pieces played by the BBC Orchestra under conductor Adrian Boult. However, the acoustics of the new building meant it was played infrequently as the organ could be heard in other studios four floors up. Added to which concerts were in turn affected by dance bands rehearsing in the sub-basement, prompting this memo in February 1933. "I understand that on Monday last the second half of the chamber concert in the Concert Hall was badly interfered with by Jack Payne's band in studio BA." By October 1936 the Corporation had a second in-house organ, a mighty Compton theatre organ sited at St George's Hall over the road from Broadcasting Hose in Langham Place. 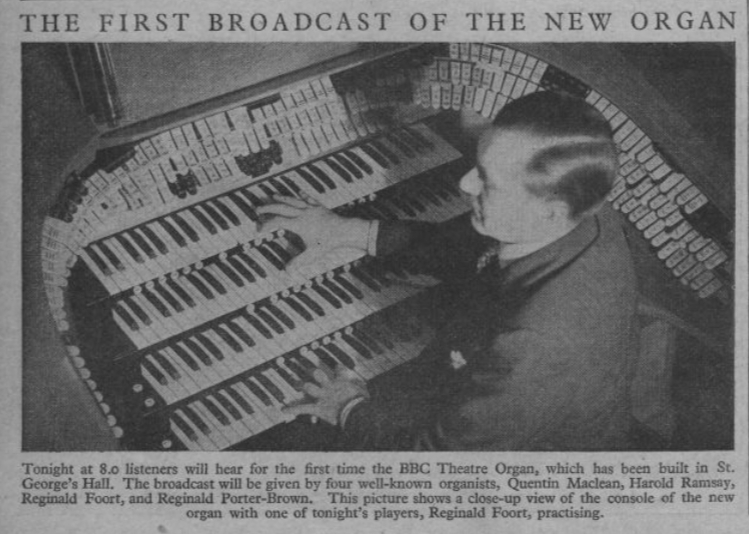 The BBC now employed a resident organist, Reginald Foort, a cinema organist who'd been making broadcasts since 1926. He stepped from the position in 1938 and there was a special concert to mark the event on the National Programme on 31 October. Announcer Stuart Hibberd was moved to pen a couple of verses to the tune of Spanish Ladies. It ended "Now let every man drink off his full bumper, And let every man now drink up his port, We'll sing and be jolly and drown melancholy, With 'Here's to the Health of Reginald Foort.'" Foort worked in the USA for a while but after the war he continued to make broadcasts for the BBC until the early 1970s. Taking over from him as the staff organist was Sandy MacPherson, the organist at the Empire in Leicester Square. It was Sandy that would sustain radio audiences during the early days of the Second World War when the BBC was unsure what service to provide and apart from news bulletins and official announcements was happy to fill hours of airtime with Sandy at the console. He made 23 broadcasts in the first week and 22 in the second. This prompted some listeners to write in that they would rather face the German guns than hear more MacPherson! The BBC Theatre Organ itself was destroyed when St George's Hall was bombed in September 1941. Foort loaned the corporation his Möller organ which they then bought outright in 1946 (and subsequently sold in 1963). Embed from Getty Images MacPherson (above) was heard on air in hundreds of programmes until the end of the sixties, his shows included From My Postbag (1939-59), The Twilight Hour (1939-56), Sandy Calling (1940-44/51-62), I'll Play to You (1943-48), Sandy's Club (1962-63), At Your Request (1963-64), Melody Time with Max Jaffa (1965-68) and the long-running Chapel in the Valley (1949-69) a programme of "sacred songs and old favourites from the hymn book" set in the "delightful land of Let's Pretend". The BBC's third organ, again built by Comptons, is the one in the Maida Vale studios and very much still in use for BBC Symphony Orchestra rehearsals. Organ music broadcasts weren't confined to the BBC though. The pre-war Radio Normandy had interludes of cinema organ recitals and Radio Luxembourg featured Reginald Foort and the two Blackpool-based organists Horace Finch and Reginald Dixon, the latter playing listeners' requests in the Cadbury sponsored You Call the Tune. 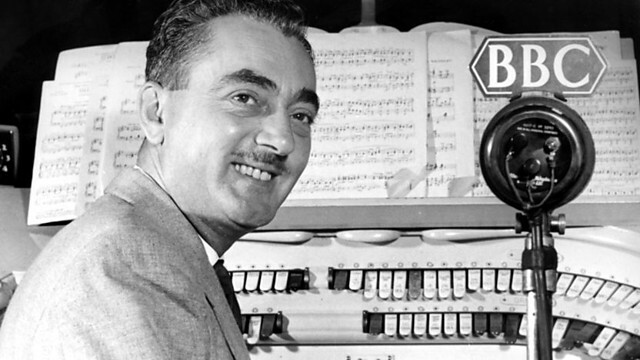 Reginald Dixon, dubbed Mr Blackpool, had started playing professionally in 1930 and over a period of fifty years made hundreds of broadcasts at the Tower Ballroom organ. Post-war his shows included Tuneful Tempo and Meet Me at the Tower as well as being a regular performer on the variety bill of the long-running Blackpool Nights (1948-66). His final broadcasts were working alongside Sam Costa on Sam on Sunday (1979-80) where he played the BBC's Theatre Organ from the Playhouse Theatre in Manchester. This was the third incarnation of the BBC's Theatre Organ, a Wurlitzer bought from the Empress Ballroom in Blackpool in 1970 and disposed of in 1985. Here's Reginald Dixon playing in an edition of Blackpool Nights as heard on the Light Programme on 18 June 1963. The presenter is Jack Watson. Reginald's retirement in 1970 was marked by a special broadcast concert on Radio 2 with guests Vince Hill and the Northern Dance Orchestra under the direction of Bernard Herrmann. A copy of Goodbye Mr Blackpool has been uploaded to Soundcloud here. Other organists heard regularly on BBC radio included Douglas Reeve, for many years associated with the Dome in Brighton. 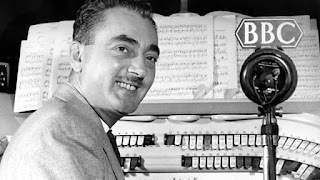 He was discovered by Reginald Foort who dubbed him the Wonder Boy Organist and made his first broadcast in 1937 aged just 19. He broadcast regularly until 1980, like Reginald Dixon working on Sam on Sunday and made occasional appearances as late as 1998. Charles Smart had a similarly long broadcasting career starting in 1935 and continuing through to the early 70s. Pre-war he was the regular organist on Melody Out of the Sky that featured Jay Wilbur and his Band and on the comedy show Band Waggon with Arthur Askey and Richard 'Stinker' Murdoch. Here's Charles at the BBC Theatre Organ at St George's Hall in a sketch from the show recorded in March 1939. Charles Smart's son Harold was also a well known organist. Aged just 15 he'd been appointed cinema organist at the Odeon in Haverstock Hill and made his first radio broadcast that same year (1937). In the 1950s he would appear with the BBC Show Band under the direction of Cyril Stapleton and the song a minute show Sing It Again and on ITV was the resident organist on the Take Your Pick! On Radio Luxembourg his quartet could be heard on Smart Work with Gumption (sponsored by Gumption Smooth Paste Cleaner) and Smart Work. In the 1960s he played on numerous editions of Morning Music and, with various musical combos from a trio to an octet, recorded sessions for Swingalong, Strumalong, Music Through Midnight and Sunday Special. His final broadcast was in 1978 on The Organist Entertains. Dudley Savage was a cinema organist working for the ABC in Plymouth for decades. He first broadcast in 1938 and post-war was heard playing listeners requests on the Home Service and later Radio 2 in As Prescribed (1948-1976) with the emphasis on requests from "patients in hospital or at home". One programme that regularly featured cinema organists was Music While You Work (1940-67). 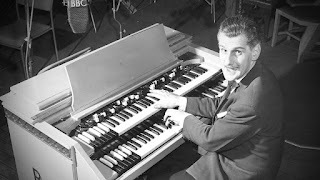 Over fifty organists appeared throughout the run including Dudley Beavan (playing on the inaugural programme) , Sandy MacPherson, Robin Richmond, Florence de Jong, Reginald Foort, H. Robinson Cleaver, Donald Thorne, Charles and Harold Smart, Ena Baga and Jimmy Leach who, playing Hammond organ with his group the Organolians, was on the final regular broadcast on 29 September 1967. Of course there was more than just cinema and theatre organ music to be heard. The Hammond organ and electronic organs were featured in jazz programmes. Concert organ music was on the Third Programme/Radio 3 and later on Classic FM. Church organs were heard on Sunday services and Choral Evensong. In the 1960s you were more than likely to hear a record by Klaus Wunderlich on Housewives' Choice. Specially recorded sessions were made for a whole host programmes from Night Ride (Harry Stoneham's Trio were regulars) to Charlie Chester's Sunday Soapbox. And when local radio started some stations included organ music: local concert organist Arnold Loxam was a fixture on Radio Leeds for many years, Charles McNichol played on Radio Nottingham and Radio Manchester had Pedal, Percussion and Pipes with Alan Ashton. This brings us to 1969. Organ music, certainly the playing of popular tunes, was less frequently heard on air. Hundreds of cinemas and theatres had closed and any organs sold off or destroyed. But there was, according to Robin Richmond, a revival of interest in the theatre organ. Richmond presented the pilot edition of The Organist Entertains on Radio 4 in April 1969 and on 11 June over on Radio 2, what was to be the start of a 49-year run of the programme proper. Both theatre and electronic organ recordings were featured with performances from Harold Smart, Gerald Shaw, Len Rawle and others. 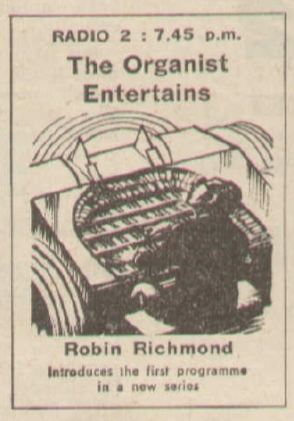 Here is that first edition of The Organist Entertains. "The BBC broadcast cinema organ music almost every day. Reginald seemed to be a popular name with the organ stars! We had Reginald Foort, Reginald Dixon, Reginald New and Reginald Porter-Brown. Other great players were Quentin Maclean, Sidney Torch, Harold Ramsay, Frank Newman and, of course, Sandy Macpherson. Somewhere around 1935, I was about to have built a mammoth travelling pipe organ to tour the music halls, when someone told me about the new electronic wonder that had no pipes and would be far easier to move around. So it came about that I myself bought the first two electronic organs to reach England, and together we blazed the trail in cabarets, dance halls, hotels and music-halls, concentrating on jazz and popular music. There was an overlap period of some fifteen years from 1935 to 1950 when both cinema and electronic organs were popular, but gradually the electronic organ jumped ahead, possibly because it was so easy to transport. Now there is a great revival of interest in the theatre organ, not only in this country but also all over America. Hundreds of these fine instruments are being rebuilt and re-housed by the ever-increasing army of enthusiasts. Perhaps our new series The Organist Entertains will 'organ-ise' many new friends! The new series proved popular and a few weeks later this letter appeared in the Radio Times from a T. Whitehead of Keynsham: "Having heard the first two programmes in the new series I have only one comment - magnificent! A thousand thanks to the BBC and Robin Richmond for this opportunity to hear such a range of top players and instruments. I recall with nostalgia the days when theatre organs were broadcast daily, and how thrilling it is to hear their sound again". Robin Richmond (pictured above) was a natural choice as presenter of The Organist Entertains as he was both an organist of some 30 plus years standing and a regular broadcaster on the Light Programme. He'd started out as an organist at a local mission hall before playing more of the popular dance music of the time. Early professional engagements were in West End revues and he made his first broadcast in 1938 on what was billed as his "Modern Miracle Organ", an early example of an imported Hammond electronic organ. Rejected for military service during the war he was the organist at the Paramount cinema on Tottenham Court Road, had a dance band at the Hammersmith Palais and was on a 24-hour standby contract to play on BBC radio. An early series was Starlight (1942-45) and he appeared on dozens of editions of Music While You Work with various musical combos. After the war he played and presented his own show Organ Grinder's Swing - he would sign off "from your old organ grinder friend" - and was regularly on the bill of Variety Bandbox. Other broadcasts included Bumblethorpe with comedian Robert Moreton, Morning Music, the BBC tv series Emney Entertains with the rotund actor and comedian Fred Emney as well as providing the musical punctuations on Associated-Rediffusion's Double Your Money. In the late 40s Robin had also started to present other music shows including Housewives' Choice, Jazz Club, Playtime, Twelve O'Clock Spin and Midday Spin. He also moved into the producer's role on Radio 2's Album Time. 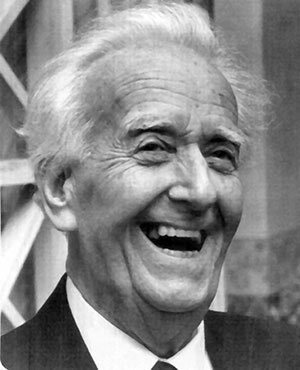 Robin retired in 1980 (he died in 1998) and was replaced on The Organist Entertains by Nigel Ogden. Nigel, like so many of the organists mentioned here, started young. He took up the organ aged 12, inspired by his father who was a church organist and by holiday visits to Blackpool where he saw Reginald Dixon perform. He made his first radio broadcast in 1971 aged 17 on Pedal, Percussion and Pipes and the following year on Radio 2. He continued to play on The Organist Entertains and appear on Radio Manchester throughout the 70s before taking over the presenting role. On 16 March 1990 Nigel marked his tenth anniversary on the show with this special edition. Understandably many listeners and organ enthusiasts were dismayed to hear the news in January that The Organist Entertains was to be "rested" although there had been some criticism of late that the programme eschewed electronic music in favour of pipe organs. UK radio provides little in the way of outlets for popular organ music though Alan Ashton has a monthly online show and Angel Radio features Hot Pipes in its schedule. Classical organ pieces can be heard on Radio 3's Choir and Organ. The final edition of The Organist Entertains goes out on Tuesday 8 May at 11pm BST. Rested is, according to one dictionary definition, "healthy and active after a period spent relaxing". But you can be sure that when a BBC press release is issued that any programme marked up as "rested" will not be making a return to the schedules. It will be forever consigned to the archives. In January Radio 2 announced a schedule shake-up that comes into effect later this month. Getting the elbow, sorry, "rested", are The Organist Entertains, Listen to the Band and The Radio 2 Arts Programme. All shunted into the sidings as the network becomes increasingly popified. I'll be looking at the history of organ music and brass bands music programmes later this week. 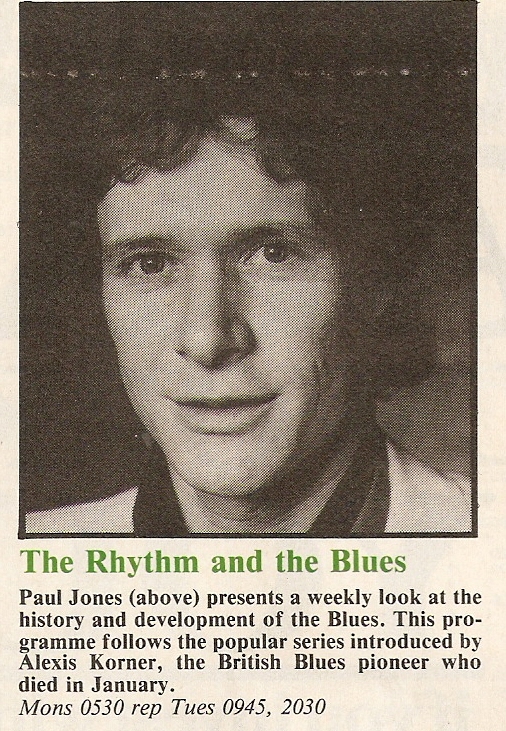 Another casualty of the changes is Paul Jones, presenter for the last 32 years of a rhythm and blues show. Jones is, of course, steeped in the music of the British R'n'B scene and is a contemporary of the likes of the Stones, Long John Baldry and the late Alexis Korner. Jones talks of "passing over the baton" though one suspects he would have relished the chance to stay on. 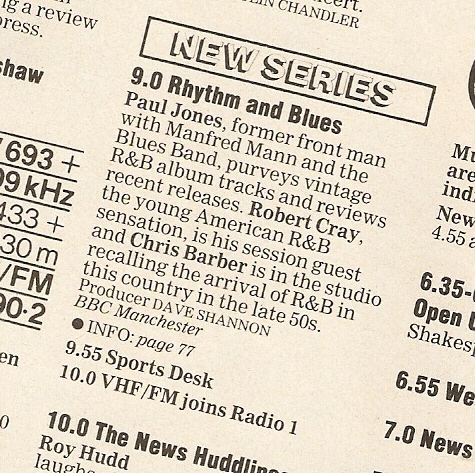 The programme started on 10 April 1986 produced in Manchester by the late Dave Shannon. Paul's first guests in session were Robert Cray and Chris Barber. 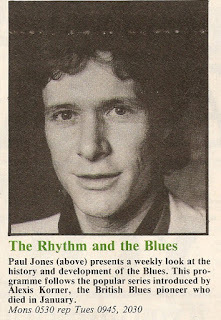 Paul had broadcast a few times before but most of these shows were on the BBC World Service with Counterpoint in 1982 and 1983, and again in 1986, and taking over from Alexis Korner on The Rhythm and Blues Show from March 1984. On Radio 2 there had been a three-part series on R 'n' B in 1985 and the week before the new show started he'd sat in for David Hamilton. His Radio 2 Rhythm and Blues programme remained a Thursday night fixture until April 2007 when it moved to Mondays. From Monday 25 April 2011 comes this specially extended show marking Paul's 25th year on Radio 2. It includes sessions from 24Pesos, a fantastic set by Kyla Brox and Danny Blomeley and, in the second half from Marcus Bonfanti and Oli Brown. 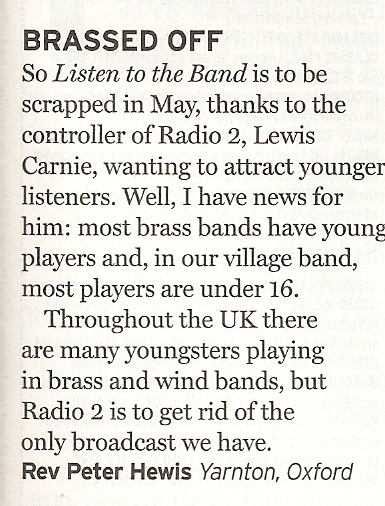 Fortunately blues music isn't to be swept to one side by Radio 2 as Cerys Mathews takes over from Monday 14 May. Paul's final show, with guest Eric Bibb, is still available to listen again.